Tracy's Bits N Pieces: The first Post! I've been putting off my first post because it feels like it should be important. A big lengthy introduction to me and what I do. But I've decided that no one really cares about all that. We just want to see pictures of quilts. So, let's get to it. Here are a couple pictures of what I'm working on now. There is ALWAYS a quilt in a hoop on the end of my couch. If I sit down to watch TV, I am under a quilt quilting. This is a quilt I pieced about a year ago, inspired by a quilt I saw at Cluck, Cluck, Sew. It was sitting in my WIP pile until about 6 weeks ago. It is almost done! I have one more row to quilt and then it will just need to be bound. It will be done in time for July 4th! I guess it will really be more for decoration than anything else. We won't have a huge need for warm quilts here in Tennessee in the middle of July. I am having fun following the Churn Dash Along with Amy Smart at We All Sew. The low volume fabric you see in these first 4 blocks above was my inspiration fabric for the rest of my fabric pull. I love how it is coming along. Here is what I've got so far. 22 blocks down and 26 more to go. I am loving it! Of course as most quilters I always have a multitude of projects in the works - I'll get some more pictures up soon. Congrats on your first post! and yes, we do want to know a bit about fellow quilters too! 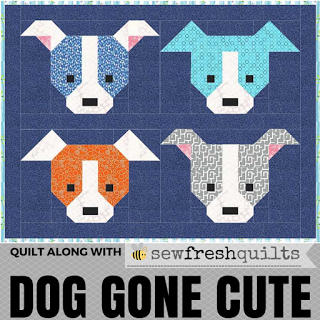 Looking forward to reading more and seeing your lovely quilt projects on your new blog! Thank you! I am having such fun sharing what I love! Thanks for sharing your projects. Your churn dashes are coming along nicely, and your patriotic quilt looks superb. It must be finished by now, so I need to take a look at the rest of your posts! Great first post :) Nice to meet you. Love that star in the hoop. Love those Churn Dash blocks...got here thru Val.